Samual Eddy serves as the namesake of the Samual Zion Foundation. BIDWELL — The loss of a child is arguably the most difficult challenge for a family to endure. For Bidwell’s Eddy family though, they have turned tragedy into hope as they spread awareness in the name of a lost loved one and honor his memory through the Samual Zion Foundation. The foundation is recognized as a nonprofit organization and was started early this year. The Eddy family has been traveling across Gallia throughout April to raise awareness for a condition recognized as congenital diaphragmatic hernia (CDH) and to raise support for research in its treatment. April is recognized as CDH Awareness Month. CDH is considered to be a birth abnormality in a fetus. With CDH, the diaphragm, a thin sheet of muscle separating the abdomen from the chest utilized for breathing, fails to form properly. A hole in the diaphragm develops and organs that should be in the abdomen may move into the chest causing issues with a child’s body functions. Samual Eddy was born February 8, 2017, the son of Jennifer and Robert Eddy. He was discovered with the condition before his birth, said his mother. The family met with medical professionals to discuss how to tackle Samual’s CDH at a meeting a week before Thanksgiving in 2016 in Cincinnati. Samual underwent a fetal MRI along with other investigative techniques to gauge his health status. His family said they practically lived in the city at that time up until they took him home due to his medical needs. Samual came home on April 27, 2017 after a variety of surgical procedures and treatments over time. On top of his diaphragm surgery, he reportedly had over 10 blood transfusions. 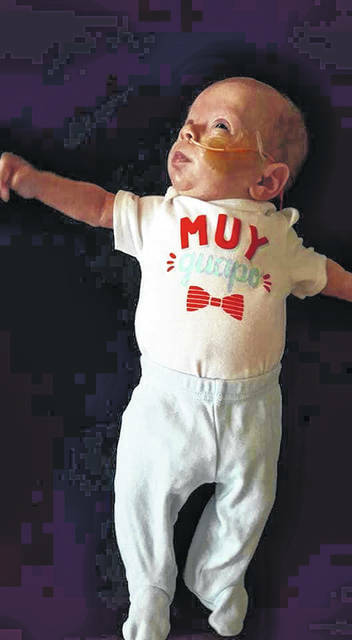 He was a little less than a month old when he had his hernia repaired, said his mother. He died May 29, 2017 due natural complications of CDH and to rhinovirus, often recognized as the common cold. He was one of seven siblings. Jennifer said that in her research around 1,600 children are found with CDH in the U.S. and around 800 of them don’t make it to their first birthdays. Reportedly, it’s found in one of every 2,500 births worldwide. In some countries, the survival rate of children with CDH is less than one percent. A CDH awareness fundraising event is anticipated to be held in Gallipolis City Park April 19 at 2 p.m. organized by the Samual Zion Foundation. The Eddy family says they plan on having a DJ along with karaoke at the event and face painting. They invite the public to attend. More information can be found at samualzionfoundation.org along with ways to support CDH research. Dean Wright can be found 740-446-2342, ext. 2103.